New Release! QCTool V3.0.12 What's new? Memory connected spreadsheet, plotter and 2D grid-style display: spreadsheet functionality and information display is critical when working with data but multi-dimensional relationships are also important. 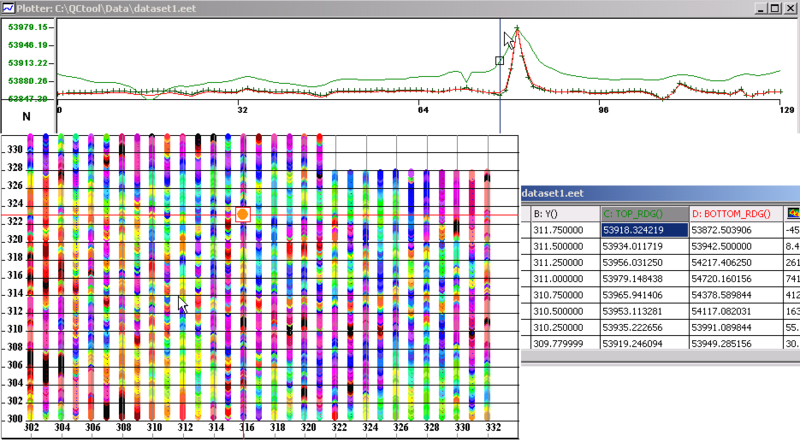 The plotter provides the ability to plot one channel (function) versus any other in the file or versus record number but the application allows the user to naturally split their data into subsets (called lines in QCTool). The plotter plots one subset at a time but the Grid Tool displays any channel as a function of any other 2 channels for the entire dataset. The important criteria is that these 3 tools are fundamental to data analyses but QCTool links the 3 tools in memory, so that when selecting a data channel for a particular data record then it is automatically selected in all 3 tools. Data compaction and Data access speed: A database typically provides data access speed while not necessarily providing a compacted data format. As the user may want to deal with millions of data points, a compact format for size is critical but also data access speeds are important. The design of essentially a compact, binary database type file structure gives this kind of capability and it is at the root of QCTool. A flexible framework for processing: By designing for essentially digital oscilloscope type functionality, we provide the framework to easily add new processing capabilities. An individual or corporation who wishes to have a framework upon which to build specific processing may do so either by contracting us to add the processing or purchasing a developer's license to build their own tools. QCTool permits import of data sets no matter what their size is. As of now, a number of formats are allowed: ASCII XYZ, binary XYZ, Geosoft GBN, Geosoft GDB, Scintrex CG3/CG5 Dump, SeaSpy and others designed to meet the specific requirements of various customers. The import procedure is fully automated and easy to manage. Data is kept in the storage format of your choice whether it is double or single precision (float), short or long integer, text or date or degree formats. There are three ways of data representation: spreadsheets, plots, and grids. All the three are interrelated and can easily be brought up for viewing at the same time. If you come across a bad-looking data in a plot, for example, you can simultaneously check it in the respective spreadsheet or grid. If you edit an erroneous data in a spreadsheet, it is automatically adjusted in the other two applications. Depending on your choice during the import procedure, you can have your data represented as a single table of an unlimited "depth" or divide them into as many smaller tables as the number of data subsets in your original file. The links between the tables differ from those used in similar applications, like Excel, due to the strict data structuring in QCTool. This feature makes it easier to work with large sets of data and saves much of your time. The spreadsheet format offers all standard functionalities usually available in similar applications. Very handy is the Formula Calculator that can be displayed at a click of the mouse to furnish you with the most commonly used mathematical functions. Easy access is provided to statistics and channel processing such data sorting, outlier removal and filtering. 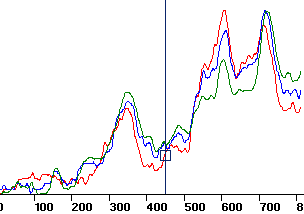 Plots are generated automatically. With them, editing data takes no time since errors are visible to the naked eye. Deleting any point on the plot will produce the same changes in the respective table or grid. You can plot as many channels as necessary to view them all at the same time; you can cut your plots into segments; switch between lines, channels, and curves; zoom in and out; change plot appearance, remove trends — all at a split of the moment. The plotting tool is not designed specifically for reporting purposes by for ease, speed and facility in data analyses. Several unique features are provided. The gridding tool provides numerous convenient functionalities. You can view and adjust profiles, apply different methods of interpolation, change draw modes, draw and customize contours. You can also superimpose your grid on a calibrated map (with calibration provided within QCTool), change from the vector to raster formats, move grid elements, measure the distance between different points, customize grid appearance and much more. 2D data displays may be made of any column (parameter) versus any other 2 parameters quickly and easily. You may show simply the parameter at the data points (x,y), interpolate the data onto regular grids using either square or rectangular grid cells. A very accurate local interpolation technique called Natural Neighbour is allowed or the more conventional global Minimum Curvature technique. Interpolated grids may be shown as equal range (traditional) or equal area (weight). 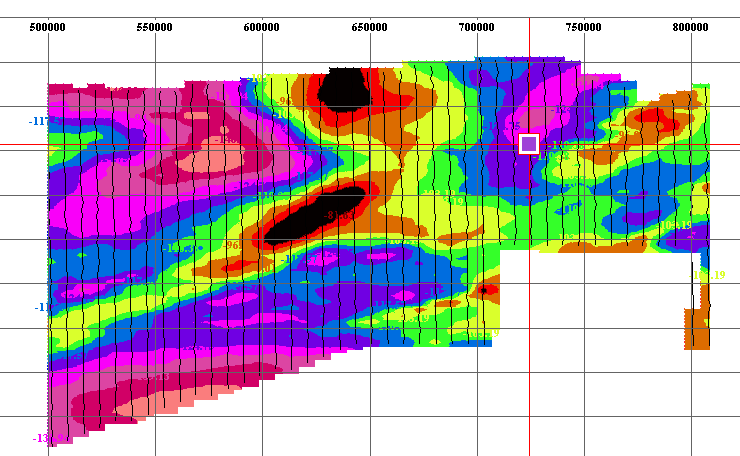 Contours may be made and filled plus many other mapping capabilities, which are integrated with 2D, plot presentations. QCtool is not designed as a mapping software product but does provide some basic mapping capabilities to aid in the analyses of data which can be related to maps. For your convenience, a special tool is designed allowing you to convert UTM into Latitude/Longitude and vice versa, with the result added into a separate column in the spreadsheet. Lambert and Polar Projections are also provided. Over 20 ellipsoid datums are provided and if you need a different one then we can provide it assuming we are given a reasonable size order. With QCTool, you can merge as many data sets as necessary and have the missing values interpolated to get the full and consistent picture of your survey. This can be done with data of different types or from different instruments but have a common data for linking such as time or date or temperature. With QCTool, you can append new data to old data. This is useful when you collect data on different days or at different times and want to bring them together. An excellent tool to fill up the gaps in your data, data interpolation is especially useful when you merge two or more files and there are a lot of missing data as a result. The only thing you have to do is to select the necessary data points to interpolate and all the rest will be done for you. Allows sorting of your data at various levels. Data Filtering uses 7 kinds of filters: low pass, high pass, band pass, band removal, mean, median and Gaussian. You can plot unprocessed versus filtered data, transform time-domain data into frequency-domain, and adjust filter settings to optimize the result. Many instruments have drift in the measurements, so an easy to use drift correction is provide. Data shifting is also provided as sometimes instruments need to be shifted in sequence when compared to other parameters. 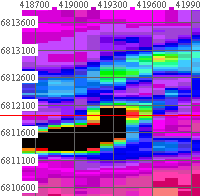 The latest world IGRF values can be determined as a function of Lat/Long, height and time. If there is a lag in your data with respect to a record index, an automated function is available to shift the data channel back or forward with respect to the chosen record index. For example, if you are using a measurement system which is towed by a vehicle and the location of the data is w.r.t. to the vehicle, then the user may shift the data back along the vehicle data track. Or, if collecting data w.r.t. to time and there is a time lag or advance, then the data channel(s) can be adjusted. QCTool now has an additional suite of gravity processing and correction techniques. It includes a special import procedure for both measured and base-station data, tools for drift, terrain, latitide, free-air and Bouguer corrections. Two kinds of gravity data are imported and merged to carry out further gravity correction - measured data in CG3/CG5 instrument dump or ASCII XYZ format and base-station and location data in CSV (or ASCII XYZ) format. When merging, you can use Transverse Mercator Calculator to match the location information in both files. 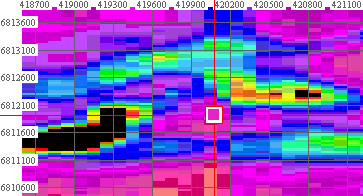 This correction provides conversion of gravity instrument readings into milliGals. Two types of Meter Calibration Correction are available - one for older meters where a constant instrument scale factor is used to multiply instrument readings by and the other for newer meters featuring a more complex relationship between the instrument readings and milliGals. In the latter case, a table of factors rather than a single constant is used. QCTool provides import of this table as well. This correction uses a special Tidal Algorithm. When computed, it is added as a separate channel to your file, to be further applied to the instrument readings with the help of the embedded Calculator. This correction is based on several loop ties, allowing approximation of a more complex drift. Drift is calculated based on the error between the first and last reading in each loop. Absolute gravity is calculated based on the known reference station and your data that have previously undergone drift correction. Two kinds of terrain correction are available - Regional and Local. The regional terrain correction is based on regional topography grids that can be created from DEM files in GTOPO30 format through a 3-step wizard in QCTool. The local terrain correction is based on a special *.qct file to be created prior to the correction procedure and to contain Station ID and at least three correctional station points around each station to be corrected. The Latitude, Free Air and Bouguer algorithms are available through the same simple interface. The newly calculated corrections can be added as new channels or overwritten into the existing channels of your file. Then the corrections can be applied using the embedded Calculator. QCTool now also includes magnetic processing functionality.